In comparison with world production, African aquaculture production remains relatively small, and in 1995 was limited to 117 761 metric tonnes per annum, or a mere 0.4 percent of the total world production (Hecht, 2000). The two principle areas of production on the African continent are the Mediterranean and sub-Saharan regions. The Mediterranean region produces the majority of the aquaculture production. In 1995, 67 percent (77 800 tonnes) of the continents aquaculture production was attributed to the Mediterranean region (Pedini and Shehadeh, 1997). Sub-Saharan production was limited to 39 200 tonnes, representing 0.13 percent of world production. The aquaculture production of the five countries that were surveyed in this study is presented in Figure 1. In 2000, Nigeria was the largest producer producing 30 776 tonnes of product. The majority of this product was tilapia and catfish (46 percent and 35 percent of production, respectively). Carp, mullet and snakehead were also produced as was a number of other fresh and brackish water species (Table 1). As the largest producer, Nigeria also manufactured the largest amount of aquafeed (10 760 tonnes, Figure 2). Nevertheless, this feed was manufactured solely for the tilapia and catfish industries, accounting only for 30.3 percent of the country's aquatic feed production. Thus, the majority (67.3 percent) of the feeds used were farm-made feeds. The dependence on farm-made products to satisfy feed requirements was prevalent in all the countries - the exceptions being South Africa and Côte d'Ivoire. Of the countries surveyed in this report, South Africa was the second largest aquaculture producer, and after Côte d'Ivoire, the third largest manufacturer of aquafeeds. While South Africa only produced 1 870 tonnes of feed in 2000 (Figure 2), production was dominated by the formal feed industry (Table 1). Indeed, in South Africa, with the exception of crocodile and some catfish farming, aquafeed production is almost exclusively undertaken by the formal feed industry. A crucial difference between South African aquaculture and that of the rest of sub-Saharan Africa is that South African production is market oriented and driven by corporate and entrepreneurial partnerships. As a result, it has focused on the production of high value species (e.g. abalone, shrimp, trout) that maximise economic earnings. Concomitant with the production of these species is a high level of technological investment that amongst others, requires sophisticated feed production systems. Aquaculture production for the purpose of food security has received little attention in South Africa. This is in stark contrast to countries such as Kenya and Zambia where much of the aquaculture production is designed to provide food security. Typically, these operations are small-scale pond culture systems in which fish production is a low investment/low return operation that cannot sustain the high input costs associated with manufactured feeds. As a result, feeds tend to be generated on the farm using available agricultural by-products. Thus, while Kenya produced approximately 1 500 tonnes of aquaculture produce in 2000 (Figure 1), it relied exclusively on farm-made feeds, and manufactured no specialised aquafeeds (Figure 2, Table 1). In 2000, Côte d'Ivoire produced an estimated 2 442 tonnes of aquafeed, and in common with Nigeria, produced feeds designed for tilapia and catfish culture. The species currently under cultivation and the origin of their associated feeds (formal or farm-made feed sectors) are presented in Table 1. It is interesting to note that the culture operations are dominated by freshwater species, and, with the exception of South Africa, there are no marine species currently under cultivation in any of the other maritime countries surveyed. While this was to be expected in landlocked countries such as Zambia, it suggests that in comparison with other regions of the world, sub-Saharan mariculture operations have yet to make an impact on production, and that the potential for mariculture operations have yet to be realized. Regionally, South Africa is currently a leader in this field, and has extensive experience in both abalone (Haliotis midae), mussel (Mytilus galoprovincialis), oyster (Grassostria gigas) and penaeid shrimp culture (Penaeus indicus). Trout culture (Onchorhynchus mykiss) is practised in both South Africa and Kenya (Table 1). Trout feed represents the largest sector of the South African aquafeed industry, and in 2001, accounted for approximately 78 percent of the countries aquafeed production. In contrast, feed production in Kenya is restricted to farm-made feeds using locally available feed stuffs. Tilapia culture (Oreochromis spp.) is widespread across sub-Saharan Africa, and was reported in all the countries under study. With the exception of Kenya, the formal feed industry supplied the culture industry with formulated feeds. In most cases, a series of formulations designed for hatchery, fingerling and growout scenarios were available. Farm-made feeds were produced in all the countries, the exception being South Africa where all the feeds were generated from the formal aquafeed industry. The lack of farm-made feeds in South Africa is probably a reflection of the type of culture operations currently in practice. Tilapia culture in South Africa is undertaken in intensive raceway/cage or pond culture systems, and is designed to generate income - and most recently export earnings. The high production levels attained in the culture systems are used to offset the additional feed costs. In addition to the intensive culture systems that - with the exception of Kenya - were reported in all the countries, there is also a small-scale component to the industry that focuses on food security issues - in particular, at the local community/farmer level. Farm-made feeds/supplements are used in these operations. While input costs are low, the returns are also low, and it is therefore not economically viable to use manufactured aquafeeds in these operations. Carp culture (Cyprinus spp.) was reported in all the countries, the exception being Côte d'Ivoire. Carp culture in South Africa and Nigeria is associated with both the consumer food industry (common carp) and the ornamental fish trade (koi). In Zambia and Kenya carp is only reared as a food fish. With the exception of South Africa where there are dedicated carp feeds available, feed supply is dominated by the informal farm-made feed sector. Catfish (Clarias, Heterobranchus, Chrysichthys spp.) culture was reported in all the countries. Manufactured catfish feeds were reported from South Africa, Nigeria and Côte d'Ivoire. Despite the presence of manufactured feeds, South African and Nigerian culture operations predominantly use farm-made feeds. Indeed, in Nigeria only 28 percent of the catfish feeds are manufactured. The figure for South Africa is difficult to ascertain, however, annual catfish production is approximately 65 tonnes, and in 2001, 8 tonnes of feed were produced. Assuming a feed conversion ratio of 1.4, this feed would have yielded 5.7 tonnes of production. Thus, in order to cultivate the remaining 59.3 tonnes of fish, approximately 83 tonnes of farm-made feed would have had to be produced, this figure represents 91 percent of the total catfish feed production. It is interesting to note that no farm-made feeds were reported for Côte d'Ivoire. It is difficult to ascertain why this should have been the case. For catfish being an omnivorous fish, farm-made feeds using an appropriate mixture of low grade agricultural by-products provide a suitable low cost diet for their cultivation. Farm-made feeds were reported from Kenya and Zambia. Mullet (Mugulidae spp.) production was reported from South Africa and Nigeria. In 2000, mullet culture accounted for a mere 0.4 percent and 1.1 percent of the South African and Nigerian aquatic production, respectively. In both countries, aquafeed production was attributed to the informal sector. Ornamental fish culture was reported in South Africa and Kenya. In South Africa feed is produced by the formal industry. While dedicated ornamental aquafeeds are produced and imported, a number of operators use trout feeds thus reducing operating costs. In Kenya, farmers produce their own aquafeeds using agricultural by-products. Crustacean culture was only reported from South Africa, where a freshwater crayfish (Cherax tenuimanus) and marine shrimp (Penaeus indicus) are currently under cultivation. A formulated feed is available for the freshwater crayfish production, and a formulated farm-made feed is currently available for the shrimp culture operation. Abalone (Haliotis midae) production was also reported from South Africa only where a specialized aquafeed has been developed. Crocodile (Crocodylus niloticus) farming was reported from South Africa and Zambia. Dedicated aquafeeds are available in both countries. However, the industry continues to source much of its feed requirements from traditional supplies such as chicken carcasses and abattoir wastes. The feed ingredients that are currently in use in aquafeed production are presented in Table 2. To date, Kenya has not developed a formal aquafeed manufacturing sector, and while there is an established sector in Zambia, all information pertaining to feed formulation was considered proprietary. Thus, by necessity, this analysis will be restricted to the aquafeeds that are in production in South Africa, Nigeria and Côte d'Ivoire. Nevertheless, cognisance will be taken of those ingredients that would be appropriate for use in aquafeed production in Kenya and Zambia. 1. No formal aquafeed industry. 2. Information unavailable - all formulations were deemed proprietary. Fishmeal and soya oilcake were found to be the principle protein sources used in all three countries. In many respects this was to be expected, as worldwide, these products remain the principle protein components of many aquafeed formulations. In addition, they are easily marketed on the international commodity exchanges, and are thus easy to obtain. During 2000/01, all the countries in this study imported fishmeal and soya oilcake products - the exception being Zambia which is self sufficient in soya products. A comparison of ingredient prices and availability is presented in Table 3. Fishmeal and soya oilcake prices in South Africa and Côte d'Ivoire are comparable, and were reported at US$460 - 467/tonne and US$230 - 247/tonne, respectively. In South Africa, the availability of both products was described as excellent, however, in Côte d'Ivoire fishmeal availability was described as adequate. Unfortunately, no information pertaining to the availability of soya oilcake in Côte d'Ivoire was provided. In common with South Africa, Zambia imports fishmeal from Namibia at US$460/tonne, and at present, is in a position to supply its soya oilcake requirements through local production - it is currently available at US$304/tonne. The availability of both these products was described as adequate. Kenya's fishmeal and soya oilcake production is currently unable to satisfy the country's requirements, and thus the country relies on imports to resolve the deficit. While the cost of soya oilcake was reported at US$427/tonne, no figure was available for the cost of fishmeals. Nevertheless, the supply of both commodities was described as adequate. In comparison, in Nigeria the prices for fishmeal and soya oilcake were significantly higher - US$530 - 1 350/tonne and US$480 - 550/tonne for fishmeal and soya oilcake, respectively. The high fishmeal price is probably a reflection of product quality and import patterns. In South Africa, Zambia and Côte d'Ivoire standard quality fishmeals are predominantly imported from neighbouring countries (Namibia and Senegal, respectively). However, Nigeria imports high value premium quality meals that are sourced from Scandinavia. It is difficult to account for the disparity in the relatively high price of soya oilcake in Nigeria and those of the other two countries. Nevertheless, import taxation is not an issue - like for other commodities, soya is imported into Nigeria tax free. Other protein sources used in the aquafeed industry are restricted to those that are locally or regionally available. In some countries, the quantities are small, and thus not sufficient to merit incorporation into formulations. For example, while brewer's yeast is incorporated into shrimp diets in South Africa, cotton oilcake is used in tilapia and catfish feeds in Côte d'Ivoire. Whereas brewer's yeast is a cheap and abundant by-product of the South African brewing industry, it is not even reported from Côte d'Ivoire. Nevertheless, cotton oilcake is the most common oilcake produced in Côte d'Ivoire, and is therefore used in that country. In contrast, in South Africa soya oilcake predominates, and there are only relatively small quantities of cotton oilcake available to the animal feed industry. With respect to carbohydrate sources, maize and wheat products are the resources of choice. In 2000/01 the price of maize in Kenya, South Africa and Côte d'Ivoire was comparable at US$120, US$136 and US$153 a tonne, respectively. Zambian maize is currently trading at US$205/tonne (December 2001), however, the price is highly variable and in the past 18 months alone, has varied between US$85 - 200/tonne - principally due to inconsistent national production. This was not the case in Nigeria where the maize price was approximately double (US$320 - 330/tonne). The price disparity was probably a reflection of commodity supplies. While South Africa was a net exporter of maize (at times to Zambia), Côte d'Ivoire was able to supply its domestic requirements. This was not the case in Nigeria where insufficient quantities of maize were produced. In addition, the maize produced was predominantly used for human consumption. At present, it is illegal to export maize from Nigeria, and it is likely that the inflated price was a result of government regulation of the commodity prices, price support through subsidies and/or direct government purchases. 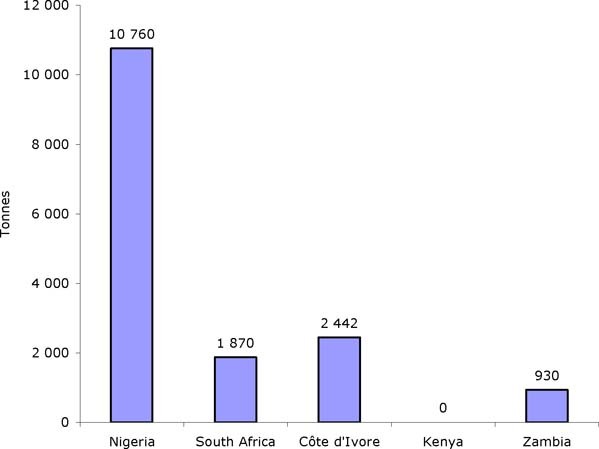 The use of wheat products was reported in both, South Africa and Côte d'Ivoire. The lipid component of aquafeeds (or a part thereof) is usually supplied by marine fish oils. In South Africa, fish oils were reported at US$246/tonne, and availability was recorded as either adequate or poor. While South Africa currently has a number of fishmeal plants producing oils, it appears that at current aquafeed production levels, it is in a position to supply its requirements. In contrast, in Nigeria fish oil was reported at US$3.75/litre, however, availability was described as poor. This is probably a reflection of the limited fishmeal processing capacity in the country (one processing plant producing approximately 8 000 tonnes fishmeal per annum). A similar situation was reported from Côte d'Ivoire, and is likely to be the case for Kenya. While fish oil use was reported from Côte d'Ivoire, the apparent lack of fishmeal processing capacity in these countries would suggest that if they were to produce high quality aquafeeds, they would have to import the fish oil fraction of the formulations. At present, the vitamin and mineral premixes used for the livestock and aquafeed industries are generally imported into sub-Saharan Africa - principally from western Europe. The exception being South Africa that produces many of its own livestock premixes and some of its aquafeed premixes. Indeed, South Africa is currently a net exporter of some premixes and exporting to Zambia amongst others. In addition, Cote d'Ivoire reported producing a small amount of its premix requirements. A number of countries reported using livestock premixes in their aquafeeds - no doubt out of necessity, and therefore a reflection of the problems acquiring dedicated species specific aquafeed premixes. While supplies were generally described as adequate, the high costs associated with these premixes - US$1 755 - 6 000/tonne - suggest that it would be advantageous to the entire livestock industry if regional production were enhanced. The major ingredients available to the aquafeed industries are presented in Table 4. It is evident that all the major ingredients that are normally used in the manufacture of livestock feeds are available in sub-Saharan Africa, and are therefore available to the aquafeed industry. Nevertheless, the growth of aquafeed production and the necessity to produce "complete" feeds will place increased competition on some resources. Thus, the prices of aquafeeds will reflect the severity of competition and the availability of conventional feed sources in each country (New and Csavas, 1993). In particular, the development of the intensive culture of carnivorous species will significantly increase the requirements for animal proteins - and in particular fishmeals. While sub-Saharan aquaculture is currently dominated by the culture of herbivorous and omnivorous species such as tilapia, carp and catfish (Table 1); this may not always be the case, particularly if there is significant expansion in the sector - in terms of both size and species under culture. Despite the preponderance of the culture of herbivorous and omnivorous species, all of the aquafeed formulations reported in this survey comprised a fishmeal component. In addition, every country in the survey reported that fishmeals had been imported in either 2000/01 or the recent past. The reliance on fishmeal as a protein source is undesirable, not only is it expensive, often imported and in limited supply, but in addition, its use in aquafeeds is in direct competition with the rest of the livestock feed industry. Aquaculture nutritionists have for some time been focusing on the replacement of fishmeal with cheaper alternative plant protein sources, and it would appear that in sub-Saharan Africa - with its cereal grains and legume resources - the application of this technology would be desirable. In addition to the conventional ingredients available for the animal feed industry, numerous less conventional feed sources were reported (Table 5). Typically, the less conventional feed sources are only available in small quantities, may only be seasonally available and are often moist. As such, they are unsuitable for commercial aquafeed production, however, they may be ideal for incorporation into farm-made feeds. Clearly, the resources presented in Table 5 are not a definitive list of potential feed ingredients that could be used in farm-made feeds. Nevertheless, it gives an indication that on a continent on which small-scale subsistence operations are common, there are viable alternatives to the formally manufactured aquafeeds. The formal manufacturing infrastructure and production estimates from the five countries in this study are presented in Table 6. The South African production is dominated by a few large feed mills (42) producing approximately 4.4 million tonnes of animal feed per annum. With respect to aquafeed production, there are two major feed manufacturing companies that run aquafeed operations. Both operations produce in excess of 1 000 tonnes of feed per annum, and thus account for the majority of the country's aquafeed production. A number of smaller privately owned companies produce between 40 - 320 tonnes per annum. The high level of technical expertise and installed capacity suggests that there is sufficient capacity to produce the country's aquafeed requirements. In contrast, Nigeria has the highest number of animal feed manufacturers (620), producing approximately 3.8 million tonnes of feed during 2000. The large number of feed mills can be attributed to the dominance of the sector by small-scale operators (59 percent of all feed mills produce between 0.5 - 5 tonnes/hour). Nevertheless, in 2000, the country's installed capacity was estimated at 7.25 million tonnes - this represents a production efficiency of only 52 percent. Thus, while only 10 760 tonnes of aquafeed were produced in 2000 (Figure 2), the gross underutilization of the feed milling capacity suggests that if there is sufficient demand, there is enough capacity installed to increase aquafeed production. A similar situation was reported from Zambia. In comparison with Nigeria, the feed manufacturing industry in Zambia is much smaller, and is dominated by only three companies (accounting for 94.5 percent of the formal feed industry). Nevertheless, during 2000, two of the three major feed manufacturers reported operating at around 50 percent of capacity. Thus, an expanding Zambian aquafeed industry could potentially absorb some of the excess production capacity. In 2000, animal feed production in Côte d'Ivoire and Kenya were 106 942 and 400 000 tonnes, respectively. 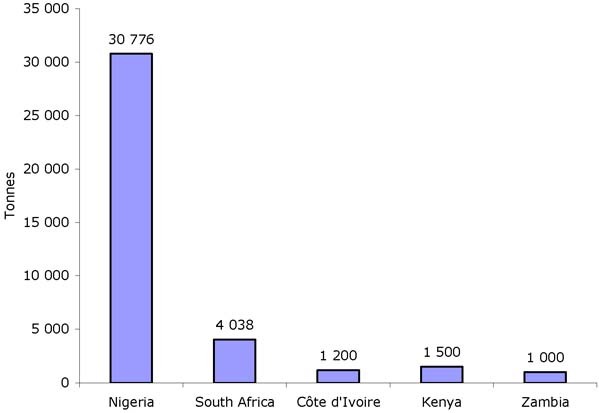 Production capacity in these countries was restricted to eight manufacturers in Côte d'Ivoire, and over 30 millers and premix suppliers in Kenya. Unfortunately, there is no information pertaining to the production/utilization levels of these installations. a. This figure represents the formal sector and represents approximately 60 percent of countries' total feed production. b. 440 private, 126 cooperatives, 54 publicly owned mills. c Eight manufacturers - the number of feed mills was unavailable. d Three major manufacturers produce 96 percent of the country's formal feed - the number of feed mills was unavailable. The growth rate of sub-Saharan aquaculture is extremely difficult to predict. In part this is owing to the diverse economic and environmental conditions, culture techniques and practices that are employed in the region. In addition, it is also owing to the substantial variation in annual production figures that are reported for the various countries within the region (FAO, 1999). For example in 1990, Kenya reported an aquatic production of 1 236 tonnes, which by 1994 had increased to 1 385 tonnes. By 1996, production had dropped to 505 tonnes and by 1997 it had dropped further to 145 tonnes (FAO, 1999). Current 2000 figures suggest that production has recovered to 1 500 tonnes. The lack of a discernable signal within this and other data sets makes it difficult to model the growth of the industry, and as a result, it is not possible to use these data sets to calculate meaningful growth extrapolations. As a result, the analysis presented is based on countries' aquatic and aquafeed production in 2000. The model assumes growth in which the aquaculture and aquafeed industries expand at either 2 percent, 5 percent or 10 percent per annum (Annex 1). It should be noted that the analysis assumes that over time feeding strategies and the ratio of farm-made/commercial aquafeed production remain constant. At a growth rate of 2 percent per annum, South Africa's projected aquatic production in 2015 will be in the region of 5 435 tonnes and requires 2 517 tonnes of aquafeed. If the growth rate is increased to 10 percent, the country will produce 16 868 tonnes of produce, requiring 7 811 tonnes of aquafeed - an approximate four fold increase in the size of the industry. A comparison with the current production capacity (during 2000, the formal feed industry produced 4.5 million tonnes of feed) suggests that even at a 10 percent annual expansion of the aquaculture sector, the aquafeed requirements in 2015 will represent less than 0.2 percent of the country's current manufacturing capacity. Thus, it may be concluded that the current manufacturing capacity within South Africa is sufficient to accommodate likely increases in demand from the aquafeed sector. By 2015, Nigeria will produce 128 559 tonnes of aquatic product, requiring 44 947 tonnes of aquafeed - assuming an annual growth rate of 10 percent within the sector. This being the case, Nigeria's aquafeed requirement in 2015 will represent a mere 0.1 percent of that produced by their animal feed industry in 2000. Thus, it is likely that in the foreseeable future, and in common with South Africa, the Nigerian animal feed industry has sufficient capacity to absorb the country's projected aquafeed production requirements. In comparison with South Africa and Nigeria, the situation in Côte d'Ivoire and Zambia is slightly different. Again, assuming their aquaculture and aquafeed industries expanding at a rate of 10 percent per annum, 5 013 and 4 177 tonnes of product will be produced by Côte d'Ivoire and Zambia, respectively, in 2015. In order to attain these production levels, Côte d'Ivoire will have to produce 10 201 tonnes of aquafeed - representing 9.5 percent of current animal feed production capacity, and Zambia will have to produce 3 885 tonnes of feed - representing 4.9 percent of current animal feed production capacity. Thus, as a percentage of current manufacturing capacity, the formal feed manufacturing industries in Côte d'Ivoire and Zambia will have to expand to a greater degree than those industries from either South Africa or Nigeria to accommodate the projected aquafeed requirements. Nevertheless, in real terms, the quantities of feed required in 2015 will be quite modest (10 201 tonnes in Côte d'Ivoire and 3 885 tonnes in Zambia). Thus, one small aquafeed mill producing only 15 000 - 20 000 tonnes per annum would more than satisfy the country's requirements. As there is currently no formal aquafeed manufacturing in Kenya, it is difficult to predict the feed requirements in 2015. Nevertheless, 6 266 tonnes of aquatic product will be produced in 2015 - assuming an annual industrial increase of 10 percent over this period. This figure is approximately 50 percent greater than that projected for Zambia. If it is assumed that the ratio of formal aquafeeds/farm-made feeds becomes comparable in both Kenya and Zambia; then using the comparable estimate for the Zambian aquafeed requirements in 2015, the projected Kenyan feed requirement will be 5 828 tonnes - again a relatively small amount that could be produced by just one small feed mill. A number of indicators providing a measure of a country's potential to produce commercial aquafeeds have been identified. These indicators fall into the four broad categories that are discussed below. It is generally held that the development of commercial aquafeeds requires an established commercial livestock feed manufacturing sector. Of particular importance is the level of infrastructure within the industry. While it is evident that some aquafeeds require specialist manufacturing techniques (e.g. high energy/lipid formulations), the majority of the processing (milling, extrusion, etc.) can be undertaken using conventional animal feed manufacturing technologies. Thus, the presence of existing infrastructure and in particular of spare manufacturing capacity is a key indicator of a country's capacity to produce aquafeeds. Indeed, the development of a country's aquafeed industry is intrinsically linked to their livestock feed manufacturing capacity. Thus, countries that are in the initial stages of developing their aquafeed industries tend to rely on spare capacity within the livestock feed industry to produce their feeds (e.g. Zambia); while those that have established aquafeed industries tend to have their own specialist infrastructure that developed from, and are often subsidiaries of, existing livestock feed manufacturers. The availability and costs of suitable feed ingredients are a prerequisite to the development of a viable aquafeed industry. While the results of this survey suggest that carbohydrate sources (e.g. maize or wheat products) are locally produced, cheap and readily available across the region, other dietary components are not so cheap or readily available. For example, while conventional aquafeed formulations rely heavily on fishmeals to provide much of the dietary protein, all of the countries in this study reported imports of fishmeal - and in some cases - at prohibitively high prices. A similar situation was reported for fish oil as well as for vitamin and mineral premixes. Potential investors should examine the cost and availability of potential dietary components, and ensure that the supplies that are either within the country or imported are cost effective and available in sufficient quantities to support feed production targets. Furthermore, it should be noted that the availability of some feed ingredients is often seasonal and in insufficient quantities to warrant inclusion into commercial formulations. These ingredients are more suited to farm-made feeds. The availability of suitably trained personnel is an important consideration. The skills that are required to develop an aquafeed industry are varied and are inevitably sourced from a number of disciplines. For example, trained personnel are required to run and service the manufacturing plants. If the country has an existing livestock feed manufacturing industry, these skills may be available locally, alternatively the skills would have to be outsourced. Trained quality control and management personnel would have to be sourced, as would nutritionists and feed formulators. While some countries such as South Africa and Nigeria already have large skills bases that have been developed in their extensive governmental, NGO, university and research institutions, other countries may lack these resources, and as a result may have to rely on imported skills. Legislation and taxation issues are important considerations that have clear economic implications for all commercial enterprises. Currently, there is considerable variation between the countries' legislative and taxation policies, and as these policies will have economic implications to prospective investors, they should be investigated closely. For example, imported agricultural products are often taxed at different rates; some countries offer tax holidays to new entrants into the sector while others do not. Some countries are members of COMESA (Common Market for Eastern and Southern Africa), and as a result have removed trade barriers, while others are not members, and retain trade barriers. The following checklist is designed to assist potential investors in determining the aquafeed potential of an area in sub-Saharan Africa. - can it be accessed to provide raw materials/expertise? c. Is there sufficient capacity within the existing infrastructure to manufacture the desired aquafeeds? - vitamin and mineral mixes? b. Are the raw materials available within the country or will they require importation? c. Are the raw materials available seasonally - if so are there alternatives that can be used as replacements? d. Is it cost effective to use the raw materials? - which effect will they have on start-up costs? - which effect will they have on running costs? Hecht, T. 2000. Consideration on African aquaculture. World Aquaculture, 31: 12 - 19. Louisiana, USA. Pedini, M. & Shehadeh. 1997. Aquaculture in sub-Saharan Africa: Situation and outlook. FAO Aquaculture Newsletter, no 15, 3 - 6. Rome. New, M.B. & Csavas, I. 1993. A summary of information on aquafeed production in eleven Asian countries. In: M.B. New, A.D.J. Tacon & I. Csavas (eds.) Farm-made aquafeeds. Proceedings of the FAO/AADCO Regional Expert Consultation on Farm-Made Aquafeeds, 14 - 18 December 1992, Bangkok, Thailand. FAO-RAPA/AADCP, Bangkok, Thailand, 434 p.